I know from experience that the healing process of sutures is an itchy one, particularly as healing gets closer to completion. 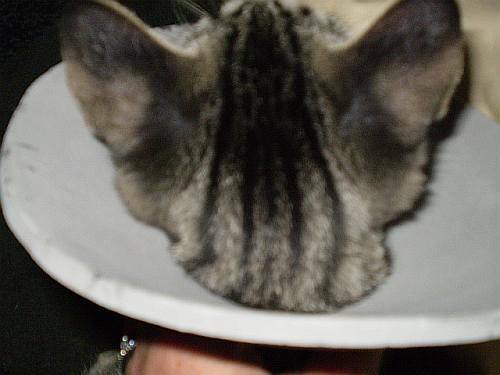 Venus's spay sutures have been no exception and she is now wanting to chew her stitches. After speaking with my vet's office, I tried the many helpful suggestions they provided to encourage Venus not to chew. As you can see in many of the PHOTOS, I've tried tee-shirts to cover the incision, "tube" style collars, E-collars, socks with the toe cut out to cover the incision line, etc. She is growing so fast that the prior E-collar Steve had made her was no longer preventing her from reaching the stitches, and she found ways around the other options - she's quite the clever girl! So last evening Steve made her a new E-collar from the same comfy packing foam as before, only this time with a bit longer "cone", and this seems to be working beautifully. Since tomorrow morning will be 10 days post-spay, we plan to call our vet to see if the sutures can go ahead and come out. Her incision appears to be completely healed at this point, so that really the only way you can even tell it's there is by seeing the suture thread itself. We have been allowing Venus to come out of her crate at will pretty much anytime we're here to supervise her, and she and Andy have really become best buddies. They play together, sleep next to one another, and drink together. 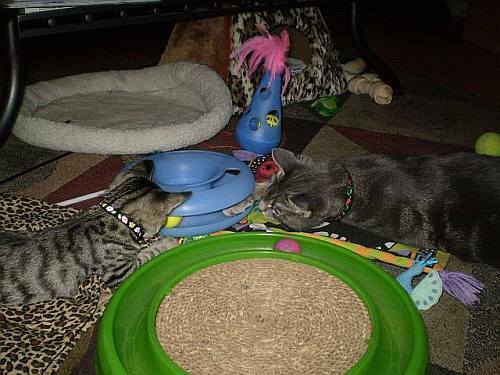 I still have to feed them separately because Andy thinks kitten food is just yummy, but I think once Venus has progressed to the "all life stages" food Andy eats, they will be fine eating together since he is happy to let her sit right next to him while he eats. Venus also just loves "her" dogs, and they think she's pretty cool, too. She still enjoys sitting on our laps and being petted, and during one of these petting sessions, I noticed that she has the cutest little light grey "heart" on the back of each ear! The photo doesn't show them very clearly even though they are quite vivid in person, because my little cheapie camera doesn't do the best job at close-ups, but you can sort of make them out along the outer edges of her ears.